Eugene and I recently spent a few days in southern Italy, eating our way around Naples and the Amalfi Coast. Though I lived and studied in Tuscany when I was in my early 20s, this was the first time I’d been back to the country in 10 years, and it made me so happy to experience a bit of that beautiful life again. In Naples we stayed by the water, looking out at the Mediterranean Sea with the island of Capri seemingly close enough to reach by swimming. Though known for their pizza, Naples also does seafood and pasta incredibly well, and the two were all I wanted to eat while there. I love how Italians eat pasta. It's a staple of the Mediterranean diet, and they serve it with seafood and seasonal veggies and the rich flavors of good local oil and garlic, producing beautifully balanced meals that are as nutritious as they are satisfying. Another common theme within their dishes is simplicity. A plate of pasta with clams, for example, is essentially that—perfectly cooked pasta tossed with simply cooked clams, good oil, and a few seasonings. Ordered, cooked, and served within minutes because there is nothing complicated or time-consuming about it. It reminded me a lot of a dish I ate often while growing up. 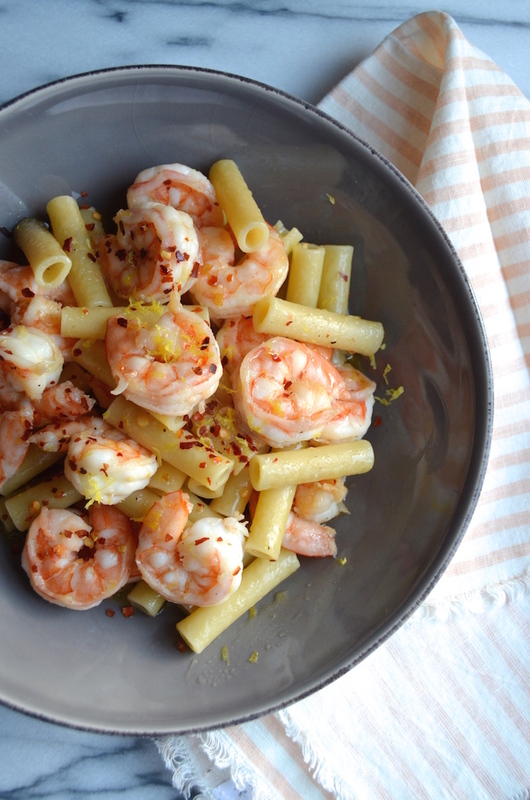 Gambas al ajillo, or Spanish-style garlic shrimp, has long been one of my family’s favorite dishes. It’s a classic tapas recipe, originally from Spain, which can often be found as an appetizer at most Spanish restaurants. 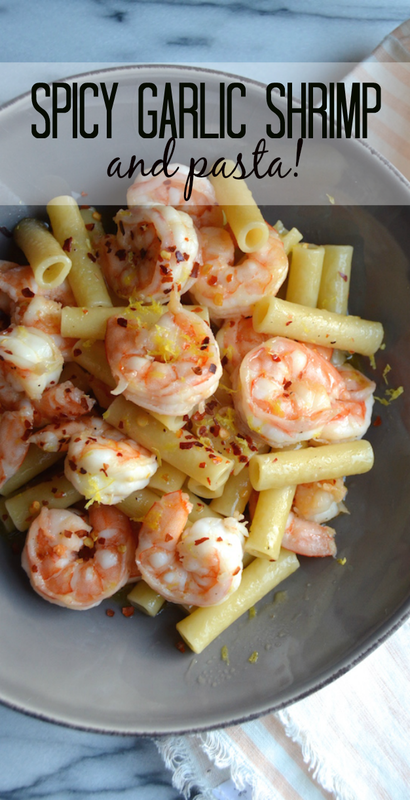 We often ordered a few dishes of it to share before a meal, quickly eating the sweet and slightly spicy shrimp before getting to the good part—the hot and super garlicky olive oil at the bottom of the dish. Like the pasta in Italy, it’s one of those Latin recipes where the simplicity is part of the appeal. 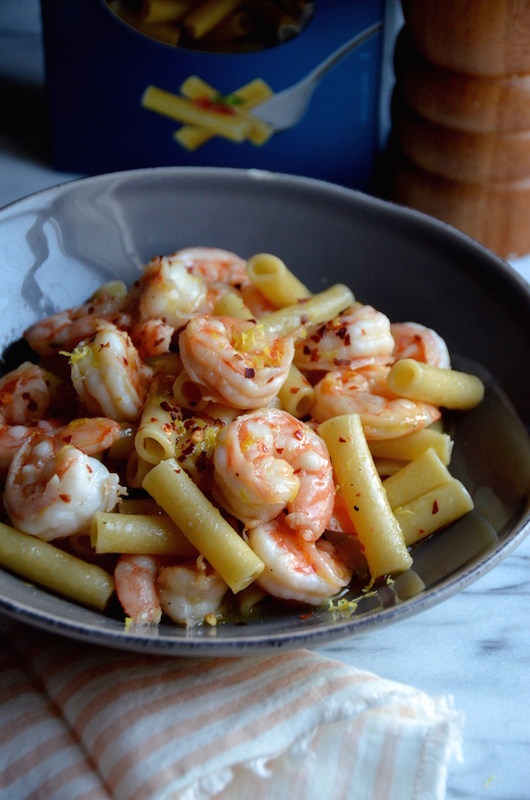 There are really only a handful of ingredients—garlic, oil, shrimp, and a few seasonings—but the final dish is so much more than the sum of its parts. Back home and craving pasta again, I decided to bring the two together; uniting the pasta and style of cooking I’d loved in Naples, with the flavors of my childhood, for a Latin-Italian fusion that satisfied all those yearnings. 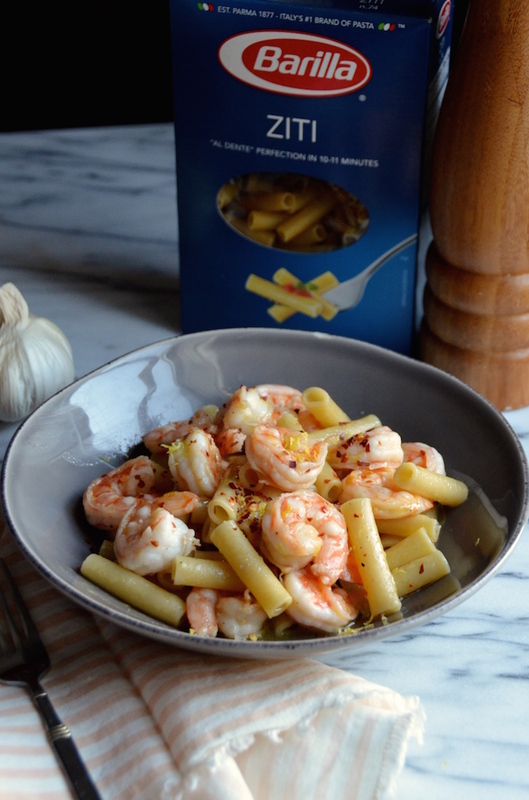 For this recipe, I used a box of Ziti from Barilla, with whom I’ve partnered to create a new recipe inspired by Latin flavors. Barilla boxes fill my cabinets even when we aren’t working together, and they’re forever my go-to for quality pasta that cooks up perfectly and doesn’t stick, and generally just makes my life easier. 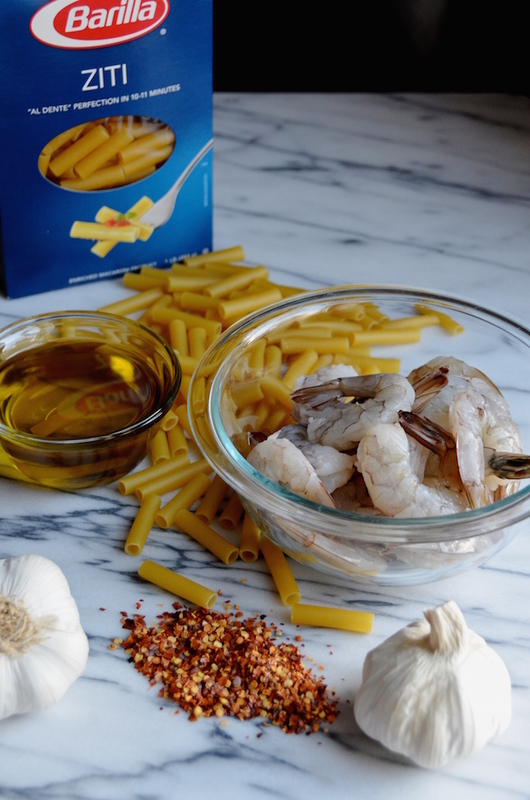 Barilla recently introduced Latino Italian Fusion, which is all about combining two family favorites--Latin flavors and spices with traditional Italian ingredients. It's exactly the way I love to cook, and so I'm excited to be able to work with them again on this! This recipe serves 8, which is perfect if you have a big family, or you can save the leftovers to enjoy for lunch or another meal. One of my favorite tips for portioning out pasta is to remember that a typical serving is about the size of a baseball (click here for more perfect pasta cooking tips). I hope you’ll give this recipe a try, and then perhaps get inspired to try to pull in some of your own favorite traditional flavors to create something new for your own family. Recipes don’t have to be complicated to be good, and that’s perhaps the best lesson of all! For more easy pasta recipes, visit Barilla.com. 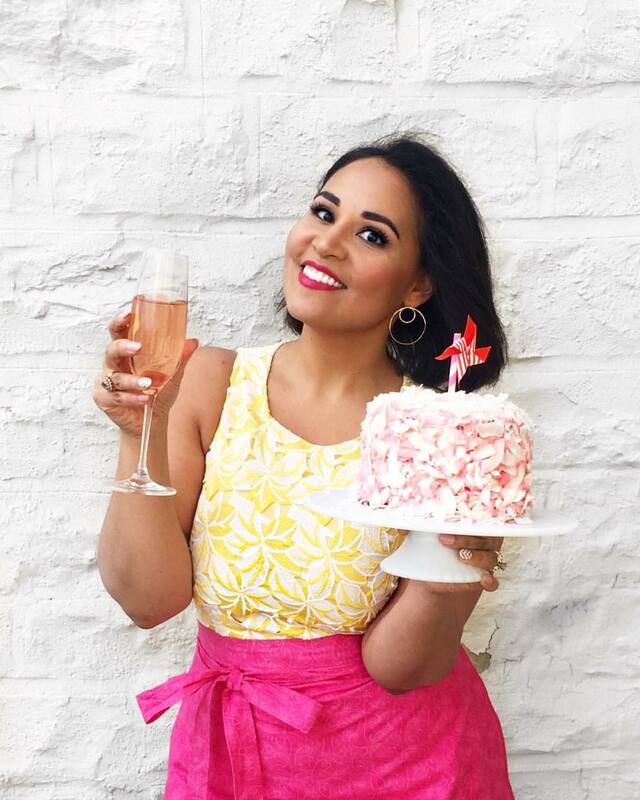 This is a sponsored post written as part of a partnership with Barilla, however, the recipes and opinions are entirely my own. Bring together Spanish flavors with Italian technique to create an easy pasta dinner recipe that will satisfy the whole family. Bring a large pot filled with 4 quarts of water to boil, and season generously with salt. Cook pasta 2 minutes less than noted on the box. While the pasta cooks, heat 1/2 cup olive oil over low heat in a large heavy saucepan or skillet. 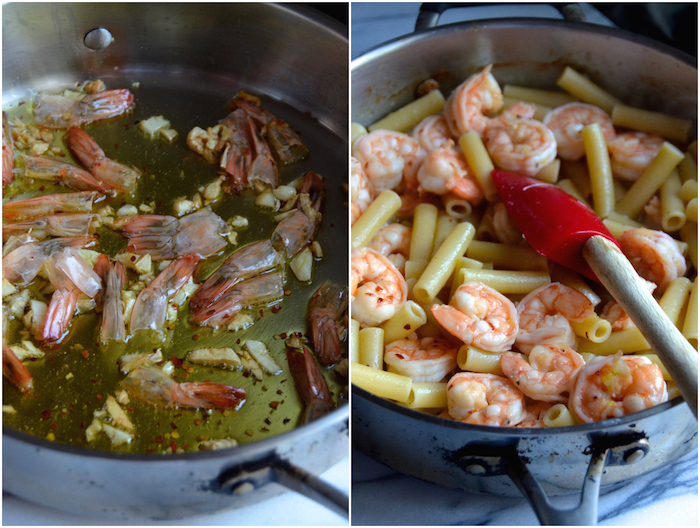 Add the smashed garlic, chile flakes, and reserved shrimp shells and/or tails. Cook gently on the lowest heat for about 5-7 minutes to infuse the oil with flavor. Remove from heat, strain out and discard garlic and shells, and return flavored oil to pan. Add shrimp and sliced garlic to oil and cook over medium heat for 3-5 minutes, or until shrimp are mostly pink. When pasta is ready, drain and add along with, lemon juice and zest. Season with a pinch of salt and some black pepper. Toss well to coat, and continue to cook 1-2 more minutes or until shrimp are full cooked. Remove from heat and taste. Adjust seasoning with additional salt and freshly ground black pepper, as needed. Serve immediately garnished with a bit more chile flakes on top, if desired.